Thing are going well with our Edible Garden. 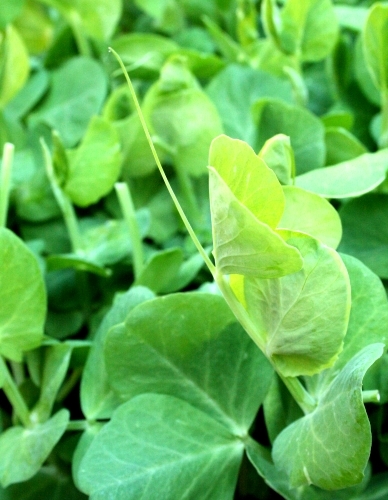 The sun is producing a plethora of fine green plants along with small hints of vibrant colour. Tonight we tried the Borage for the first time. It’s such a beautiful flower, almost like a simplified Passion Flower; taste wise the flowers it taste like mild cucumber.It is an exciting time in the garden the bees and other insects are busy and our hard work slowly beginning to pay off. For a change not many words, I’ll let the photos speak for themselves. 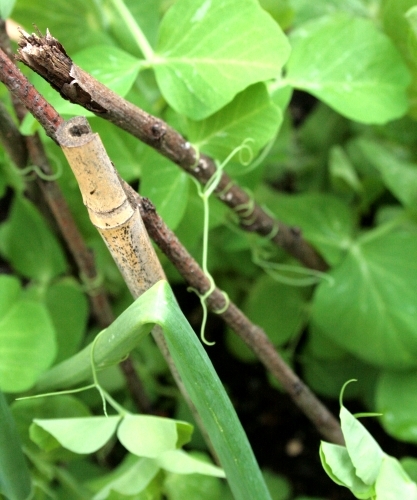 Peas – I don’t know why but I love how pea plants can beautifully twist around everything & anything they can find. Beetroot. 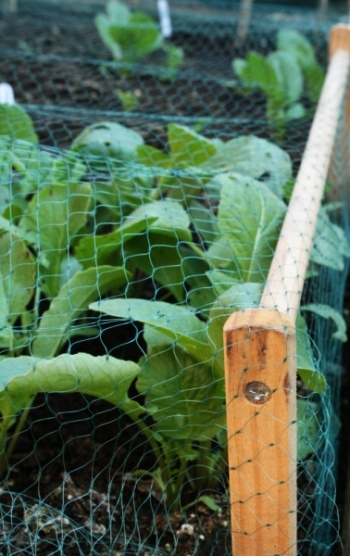 Our Golden Beetroots are not doing as well as the red beets. Finally the frosts have gone, well I hope they have, and the garden is beginning to spring into life. The biggest success so far has to be the pea shoots. After seeing Alys Fowler plant them on Edible Garden I knew I had to have a go. 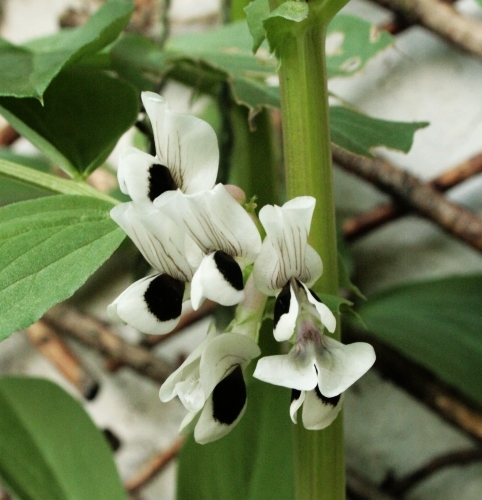 I can’t believe I hadn’t thought of planting bog standard dried peas before. 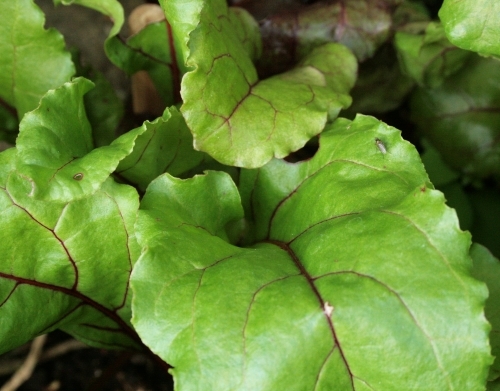 The gorgeous emerald butterfly shaped leaves have now become a regular in our salads as they taste so delicious. It’s great to see my herb garden thrive after thinking the long winter may have killed it off. The reliable hardy mint is coming back with vengeance along with the thyme and oregano. New additions in the herb garden are flat parsley and borage plus the rosemary and chives are beginning to bear flowers. The flowers on the rosemary are so beautiful and delicate almost like mini orchids, a bonus that they are edible and will probably adorn a salad at the BBQ later on this evening. The chive flowers are also edible however I find the taste of them a tad bit intense. 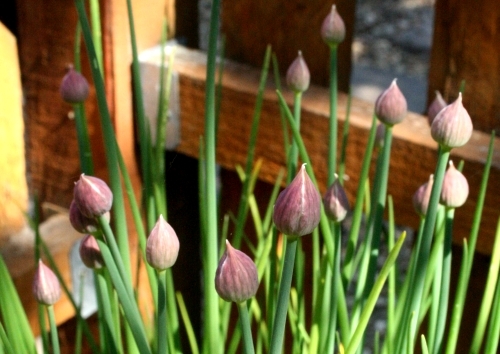 After eating a lonely chive flower last year the best way I can describe the taste is of strong onion water bursting in your mouth. This year is going to be the battle of the birds and butterflies. As much as we like having wildlife in our garden it’s a pain when the nibble and trample they crops so Hubs fashioned an ingenious frame made from an old wooden clothes airer that had originally been thrown in the wood pile for burning. The trio of dunnocks are not impressed. Given they are meant to be shy birds they have spent a significant time bouncing up and down on it, trying to break it and once working out how to get underneath the netting. The netting is doing its job though and everything growing under it is doing well. Newest addition to the garden, Hubs’ newest project, will be appearing in the next few weeks – a cold smoker that also doubles up as tandoor oven made of terracotta pots. Yep you heard that right. Some days I worry for the sanity of Hubs. The snow has gone, the days are warming up so it must be time for us to start our 2010 garden. After watching last night’s new series called Edible Garden, which is hosted by Alys Fowler, it would seem Hubs & I have been ahead of the trend. In our tiny garden everything is grown in pots, hanging baskets or in the two small raised beds down the edge. As space is limited there are a few rules as to what we plant 1) it has to be edible or useful 2) colourful fruit/veg or flowers. Hubs very much concentrates on the fruit & veg and I do the herbs. First I must point out that Hubs & I are not exactly experienced with gardening. We’re the kind of chuck-it-in-and-see-what-happens type of gardeners. Every year we learn lessons and try not to make the same mistakes the following year. 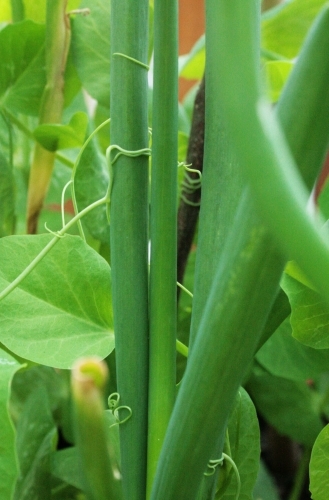 If your interested here are the links to The Garden – 2008 , The Garden – 2009 and the much toiled over Falstaff Sprouts. Squashes – triffids in disguise. They quickly take over a small garden. Globe artichokes – pretty but take up far too much room in a small garden for the amount you yield. Rhubarb – impossible to kill. Shame I don’t like the stuff. 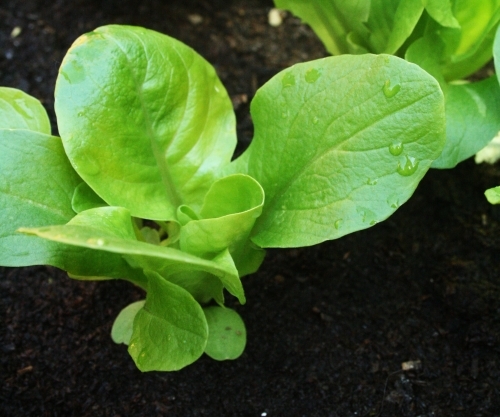 Brassicas – we are obsessed with planting them even though they can be pain thanks to pests. Hubs is always on Caterpillar Watch when we are planting these. I love flowers and until now the only flowers had been on the veg/fruit plants or herbs but thanks to being influenced by Masterchef & James Wong I’m planning to grow edible flowers alongside my herbs. I’m starting with borage & marigolds. 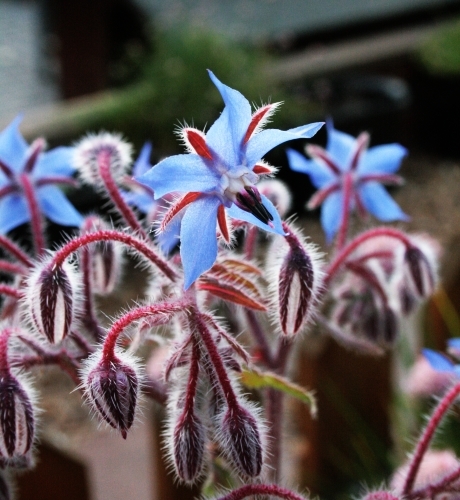 Borage – quite plain and simply I want to try it in Pimms. Marigolds – for various reasons from edible, medicinal and also companion planting as it helps to keep away aphids. 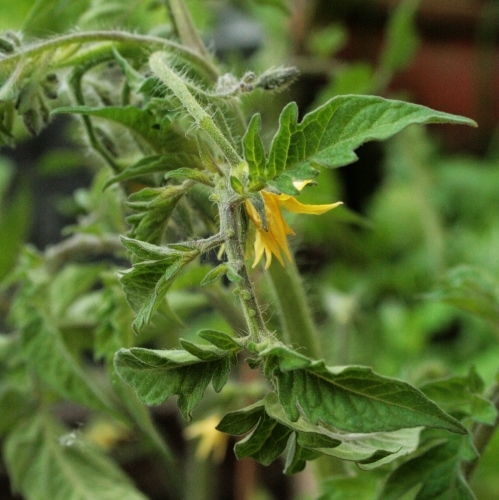 Without realising it we already do quite a bit of companion planting. Chives for aphids & blackspot in roses; Basil for flies & mosquitos, Rosemary & Sage for cabbage moths, bean beetles and carrot flies. To be honest I’m not sure if it works but given we haven’t had to use any pesticides on the garden may be a good sign. Inspired by Alys I’m also going to try and plant dried peas for pea shoots plus a few other things are bound to appear. To start quite a few of the seeds off we plant them in little biodegradable newspaper pots made with the ingenious paper potter . Not only is it a great way of recycling, the pots are gratis thanks to the amount of free newspapers we get through the letterbox. 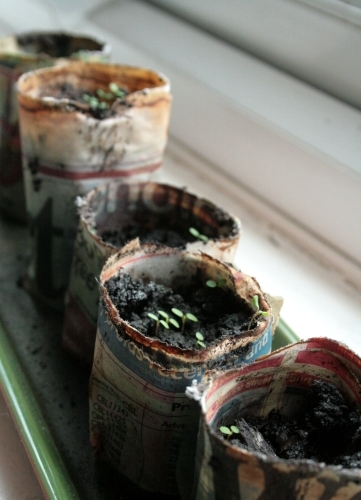 These little seeds are then germinated on either the windowsill or little greenhouses we managed to pick up in Ikea. Hubs also has got plans to build some fancy cloches to help protect some of our plants once they are in the ground. The thing I love most about gardening is the experimenting and seeing all the wildlife it brings to the garden. Nothing beats the satisfaction of eating delicious fruit or veg straight from your own garden.